International School of Informatics and Management, Technical Campus (IIIM) organised ICMIT 2018, the International Conference on the theme, Business Intelligence and Analytics: Emerging Strategies and Technologies, in collaboration with The IIS University Jaipur, Indus International University, Una, Himachal Pradesh, Western International College (WINC), RAK UAE, South Asia Institute for Social Transformation, Dhaka, Bangladesh and University of Bolton, RAK Campus, UAE. Dr. Ashok Gupta, Director, IIIM welcomed all the delegates. He said that Business intelligence is traditionally delivered to executives and managers in the form of reports or dashboards, but it is becoming more common for workers in many roles across the organization to access BI information to help them be more effective in their roles. Dr Manju Nair, Principal, IIIM provided an introduction to the conference. Dr. Nair informed that this conference is designed to address the key issues of handling the probable pressure derived from voluminous data and to explore the emerging strategies and techniques to grasp future opportunities through instantaneous strategic insights which are crucial for driving real business results and making virtually every verdict. The inaugural ceremony was graced by Mr. Basant Khaitan, Ex-Chairman, Confederation of Indian Industry (CII), Rajasthan as Chief Guest and the Guest of Honour was Mr. Saksham Choudhary, Co-Founder, Learn Code Online (LCO), Ahmedabad. Mr. Basant Khaitan in his inaugural address said that organizations of all sizes today operate in a dynamic and uncertain environment. This requires them to rapidly adapt to a host of new technologies and communication channels, including social media, mobility and web. The threat of becoming redundant and obsolete is omnipresent in today’s market landscape, which calls for organisations to take a strategic approach based on meticulous research and actionable insight. He said that the data and analytics market is undergoing a significant change. Adoption of machine learning techniques for data management and analytics, the settling of hype around big data through more mature data storage, and processing and analysis of solutions are a few of the major changes. Mr. Saksham Choudhary, was of the opinion that Business intelligence and analytics have become increasingly important in both the academic and the business communities over the past decades. The opportunities associated with data and analyses in different organizations have helped to generate significant interest in the field. The Book of Abstracts, a compilation of selected abstracts contributed by the participants of the conference was released by the Chief Guest in the inaugural session. The Session concluded with the vote of thanks extended by Dr. Raakhi Gupta, Rector & Registrar, The IIS University. The session chairs for Technical Session I on Business Intelligence and Business Analytics Applications were Prof. M.S. Pahwa, Associate Professor, Manipal University, Jaipur, and Mr. Deepak Kumar, Senior Manager, Karvy Insights, New Delhi. Mr. Juwel Rana, School of Health and Related Research, UK was keynote speaker for same. Mr. Juwel Rana in his keynote speech on Challenges and Opportunities of Big Data Analytics in Population Health Management emphasized on the concept of Big Data and Internet of Things. He said that Big data can be a powerful way to identify opportunities, but when combined with traditional organizational information the volumes of data collected can be vast and traditional storage methods can be prohibitively expensive and do not necessarily scale effectively. He discussed the application of Data Analytics techniques to the health sector. Prof (Dr) M.S. Pahwa said that Business Intelligence is needed to run the business while Business Analytics are needed to change the business. BI is focused on creating operational efficiency through access to real time data enabling individuals to most effectively perform their job functions. BI also includes analysis of historical data from multiple sources enabling informed decision making as well as problem identification and resolution. He emphasized on how we can decide what data is important. He also focused on use of data analytics for different functional areas. Mr. Deepak Kumar highlighted that effective use of business intelligence and Analytics changes the way an organization can create values and generate the Return on Investment from their stakeholders and customers. The new business models are transforming into data-oriented models and they are driven by analytics. Data visualization provided by new Business Intelligence tools has the ability to show real-time data and machine learning algorithm generates real-time insights for business decisions. In technical session I Dr. Shuchi Mathur in her research paper focused on electronic trading portal for National Agriculture Market, its working, and the problems faced by various stakeholders in the chain of agriculture marketing. Mr. Pushpendra Mishra focused on the major assumptions of CAPM Model, and its managerial implications in the current scenario. Mr. Shivram Choudhary, Prof. Harsh Dwivedi and Prof. Raghuvir Singh in their research paper on Use of data analytics in airlines to improve decision making explained how usage of data analytics is being used for discounted seat allocation, internet marketing, and dynamic pricing. The Best Paper award was given to Mr. Abhishek Dadhich. He presented his research paper on Consumer Perception towards Pharmaceutical over the Counter Marketing Strategies in the Pharmaceutical sector. In his paper, he focused on enhancing the role of OTC brand product by analyzing the consumer perception portrayed in terms of price, place and promotion. The technical session was followed by a panel discussion with Dr. Rajesh Kothari, Professor, Dean & Director, R.A. Podar Institute of Management, Jaipur, Mr. Manu Shukla, Project Officer and Consultant, SeMT, Department of Information Technology & Communication, Government of Rajasthan, Jaipur, Mr. Deepak Kumar, Senior Manager, Karvy Insights, New Delhi and Mr. Ronak Singhvi, Co-Founder, AurigaIT Consulting Pvt. Ltd, Jaipur on How Analytics Drive Business Intelligence: Profit vs. Privacy, Ethics vs. Economics. The panel discussion highlighted that Big data overcomes traditional restraints in a cost-effective manner and opens opportunities to ingest, store and process data from new sources such as external social media data, market data, communications, interaction with customers via digital channels, etc. Integrating and moving data across the organization is traditionally constrained by data storage platforms such as relational databases or batch files with limited ability to process very large volumes of data, data with complex structure or without structure at all, or data generated or received at very high speeds. Organizations need to start managing data through different sources, and integrating its usefulness via a range of technologies in the market. The panelists in the concluding session highlighted that business intelligence, analytics seek to find optimal answers. In ethics though, analytics will yield no right answer. However, as in business intelligence, the insistence on evidence and reason in ethics is critical. To facilitate this happening, opinion with reasoned justification, is the critical data that is required for effective decision making. Day two of the conference started with a video conferencing session by Engr. Chukwu Nnaemeka Paul, Information System Analyst and Consultant, Institute for Leadership and Development Communication, Abuja-Nigeria. Mr. Paul said that BI’s function is to maintain an organization’s efficiency with the data it provides, business analytics serves as an integral function under the BI umbrella. Analytics takes on many capabilities with several intricate tools that offer several different methods of analysis. He said that analytics is more about revolutionizing and improving upon a company’s process and decisions with the data that’s collected, while BI serves as a maintenance measure to help to continue working successfully in the present. As the term BI has been around for decades now, business analytics is right behind it in popularity. The convenience of having analytical tools within the BI infrastructure, takes away the need to hire analysts in your team. Its integration allows the team members to take over the role and plan for the future with confidence, knowing that the analytical tools have generated the requisite information. In the technical session on “Business Intelligence and Business Analytics: Concepts and Methods” the session chairs were Mr. Desmond Onyemechi Okocha, President, Institute for leadership & Development Communication, Abuja, Nigeria and Dr. Ampu Harikrishnan, Registrar and Dean, School of Business Management, Indus International, University, Himachal Pradesh. Mr. Desmond Onyemechi Okocha, President, Institute for leadership & Development Communication, Abuja, Nigeria said that Data and analytics leaders are upgrading traditional solutions as well as expanding portfolios with new vendors as the market innovates on ease of use and augmented analytics. The session included a wide variety of research papers focusing on Big Data Analytics for Smart Cities, Query Processing Techniques in Map Reduce, Talent Analytics, Recruiting Analytics, Testing of data for Business Intelligence, Data Mining Techniques for Depression Prediction to name a few. Dr. Vijay Gupta elaborated upon the architecture, design principles, and recent trends of Cognitive Analytical Computing in different sectors like retail, marketing, healthcare and many more. Ms. Saumya Pareek in her research paper on “Predicting Ground Water State using Naïve Bayes Algorithm” predicted the state of water wells for the next corresponding year by performing predictive analytics on the past five year ground water data provided by government. The Best Paper award was grabbed by Dr. Shuchi Singhal for her paper on “Cluster Analysis: A tool to Augment Business Analytics”. She focused on increasing profits and decreasing inputs for organizations by applying Cluster analysis on market related aspects and segments. In Technical Session III Dr. Nishtha Keshwani, Professor, Central University of Rajasthan, Dist. Ajmer talked about the scope, expanse and reach of big data and data analytics. The session chairs for this session on “Technology Oriented Business Solutions” were Dr. Nishtha Keshwani, and Prof. Kavaldeep Dixit, Professor, International School of Informatics & Management, Jaipur. The session included research papers on Campus Navigation System, Social Media Analytics, Predictive Analytics and Open source tools for Data Analytics etc. The session included a wide variety of research papers Privacy-Preserving Approaches for Big Data, Artificial Intelligence, Social Media Analytics, Motion Sensor System and Data Mining Technique to name a few. Ms. Shalu Rajawat and Ms. Vandana Nigam in their research paper highlighted that dealing with Big Data is a very tedious and time consuming mission that necessitates huge resources to handle it. Dr. Geetika Vyas, Ms. Diksha Jain, Ms. Nupur Rathore, Ms. Rupal Singhal, and Ms. Sejal Kothari presented their paper on Design Specifications of Android based Campus Navigation System: A Customized Approach. Ms. Divyanshi Goyal, Ms. Harshita Virwani and Ms. Somya Vashishtha grabbed the best paper award. They elaborated on How to predict whether any movie, which is to be shortly released would be a blockbuster or flop and what can help the Production Houses to make decisions regarding advertising, propaganda and best time for release of a movie. 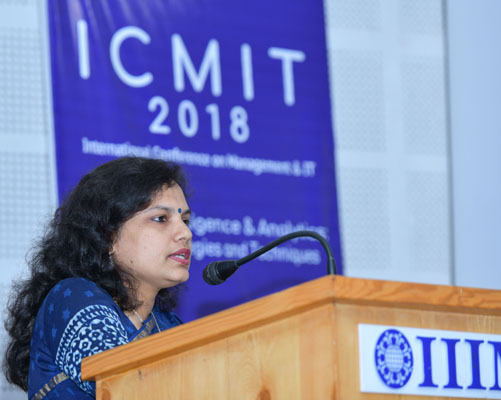 Dr. Manju Nair, Principal IIIM, thanked the guests, delegates and participants, and the reviewers, advisory committee, and co-organizers for their support for the success of the conference.